This document describes how to create (deploy) a new VM from an operating system that is stored as a 'bootable' ISO image file. An 'ISO image file' is a general-purpose file format that traditionally has been used to copy software or data to CD-ROM or DVD-ROM optical media. In cloud computing an ISO file is used as a virtual equivalent to a physical CD or DVD. This document assumes that you have already uploaded an appropriate ISO image to your VDC. See How to upload an ISO to your VDC. Deployment does not finish the installation process for your VM. What you will have is effectively an 'empty' VM with an operating system that boots from an external drive. To finish the installation you will have to start the VM console and use the installation program in the ISO to install the operating system to the VM root disk. After running an OS update (for important bugfixes, etc), you might at that point want to create a 'volume snapshot' of the VM root disk. From the snapshot you can create and store a VM template which will allow you in future to deploy a new VM in ready-to-run state. See How to take a snapshot of a volume. The ‘disk offering’: the size of the VM root disk. The VM root disk will be deployed using SSD physical media, sized according to your choice of disk offering. The size of the root disk can be increased at any time (but not decreased) for a deployed virtual machine, so long as the VM is in a 'stopped' state. 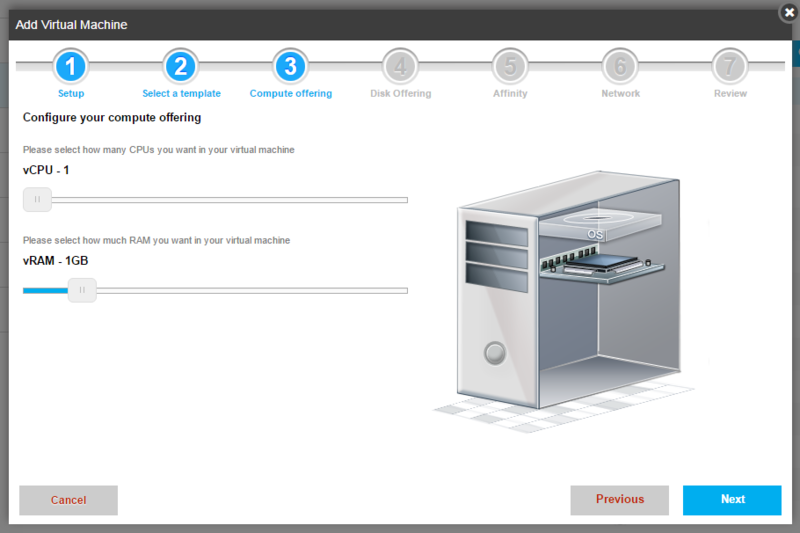 The Add Virtual Machine wizard leads you through the creation procedure in seven steps. A visual progress indicator is displayed in the form of a picture of a physical desktop PC case into which the hardware and operating system components are slotted as you progress. You can use the Next and Previous buttons to move through the steps and make changes before you are finished. Select your desired zone and hypervisor from the drop-down list. 'ESX' means the VMWare ESXi hypervisor. Click the ISO button to set the basis for the operating system. Click the My ISOs tab to show the ISOs that you have uploaded (in the selected zone). Select the ISO image you wish to use. You also need to tick the 'agree to terms and conditions' box at the bottom. You can modify these settings at any time for a VM that is stopped. Select one of the 'root disk' options in the list of offerings: 10GB VM, 20GB VM, 40GB VM, 60GB VM, 80GB VM, 100GB VM. It is recommended not to use the root disk to hold application or user data, and therefore the root disk should be deployed at a size sufficient to accommodate only the operating system and essential applications software. 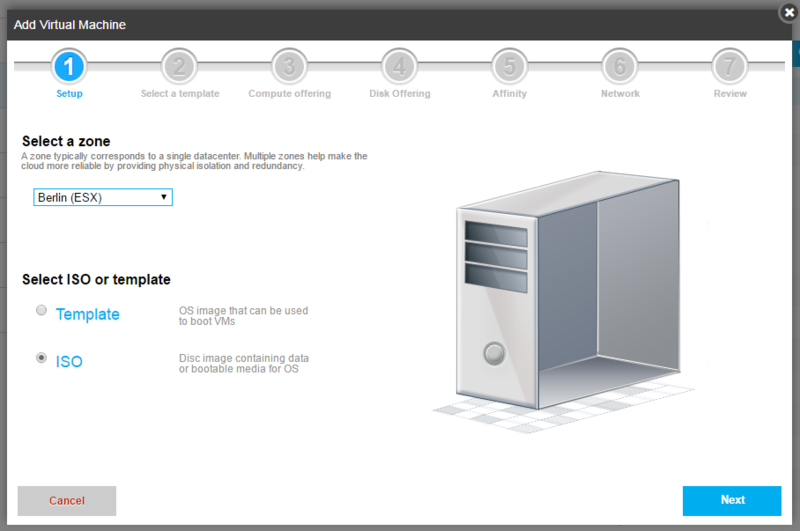 Application data and user data should preferably be stored on 'data disk' volumes; see How to add a volume to your VM. The root disk can be resized at any time if more space is required. To finish the OS installation for your VM, you must connect to the VM console (see How to access your VM using the console) and use the installation program contained in the ISO. It is usual to have the VM connected to the Internet during the installation procedure. A new VM has no network connections set up by default, inbound or outbound. To make an outbound Internet connection by setting the network egress rules, see How to allow your VM to access the public Internet network. To set up the network egress, you will need to find out the local IP address of the VM, in case you did not specify it above, at deploy step 6. 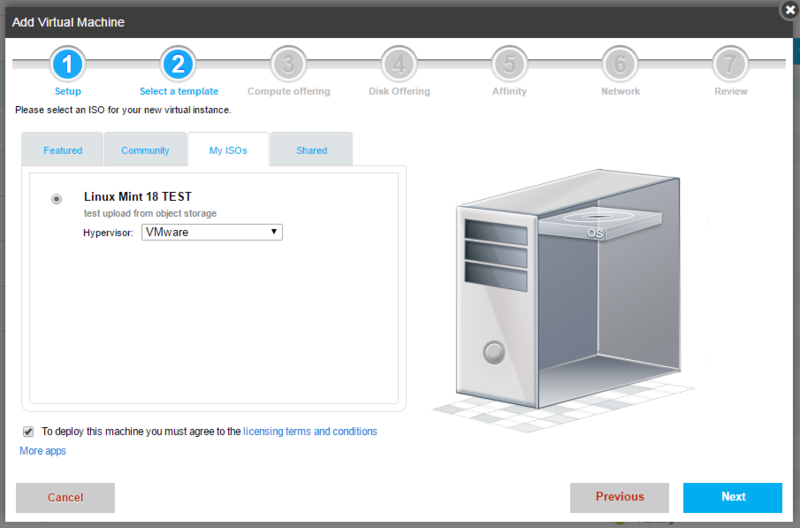 To do this, click the VM name in the Virtual Machines panel, then click the NICs tab. Alternatively, simply set '0.0.0.0/0' as the CIDR for the egress rule so that all of the VMs in the network can use that egress. 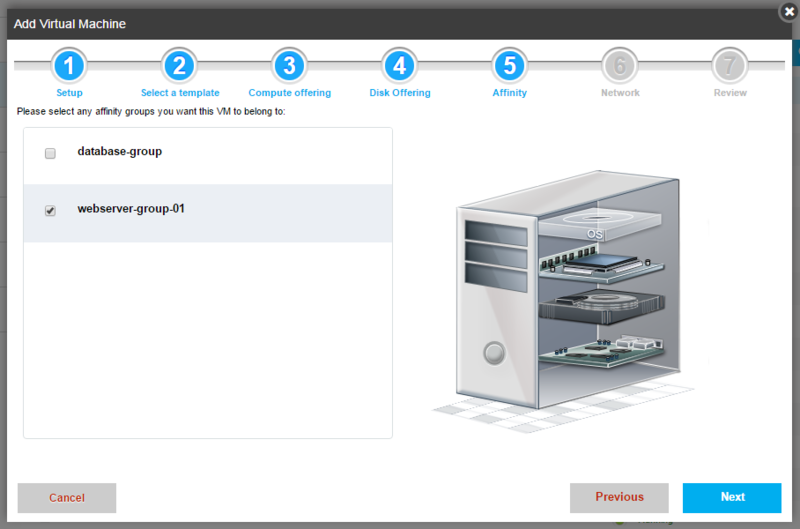 Set Protocol to All initially, and you can make the egress more restricted later when the VM is configured and running.